When it's time to say well done in your workplace or organization, single out the team that has shown excellence in Group Work. 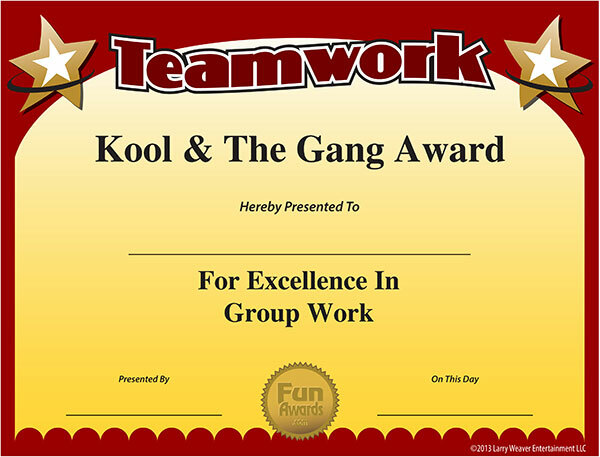 Celebrate their outstanding Teamwork with this funny gag certificate. 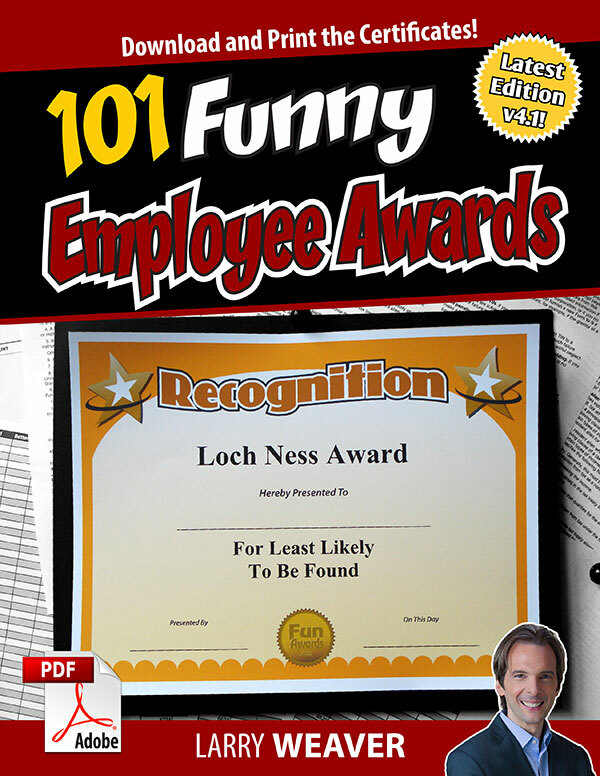 101 Funny Certificates for Employees, Volunteers, and Staff. The original that started it all! Now in its 4th edition, these awards have brought laughs around the Globe. Appropriate for any organization or type of business. Featured Awards: Duct Tape Award™, Human Vulture Award™, Swiss Army Knife Award™, It's 5 O'Clock Somewhere Award™, Loch Ness Award™, Head in the Sand Award™, Running with the Bulls Award™, Hump Day Award™, Foot-in-Mouth Award™, Rookie of the Year, Employee of the Month. 101 Funny Certificates for Office Workers. Similar to “101 Funny Employee Award”, but specifically for those who toil away in cubicles and offices. Computers, software, break rooms, desks, office gossip — it’s all covered. 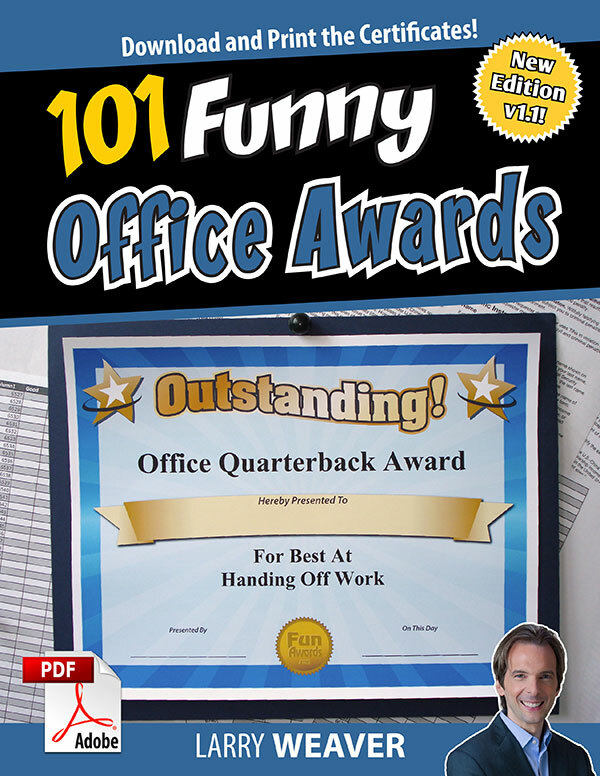 Featured Awards: One More Thing Award™, Big Kahuna Award, Social Not-Working Award™, Casual Monday-Friday Award™, Border Patrol Award™, Stop Shouting Award™, ATM Fee Award™, I'll Pencil You In Award™, Bermuda Triangle Award™, Office Quarterback Award™, Swarm of Locusts Award™. 101 Funny Certificates for Teachers, Faculty and Staff. Simply put, these awards are good-natured fun. Show teachers you appreciate their hard work, long hours, and tidy classrooms. Featured Awards: 99% Perspiration Award™, Head Cheerleader Award™, P's & Q's Award™, Abacus Award™, Night Owl Award™, Carpe Diem Award™, Single File Award™, Hall Monitor Award™, Bunsen Burner Award™, Carbon Dating Award™, Paperclip Award™, Overhead Projector Award™, Stonehenge Award™, Teacher of the Year. 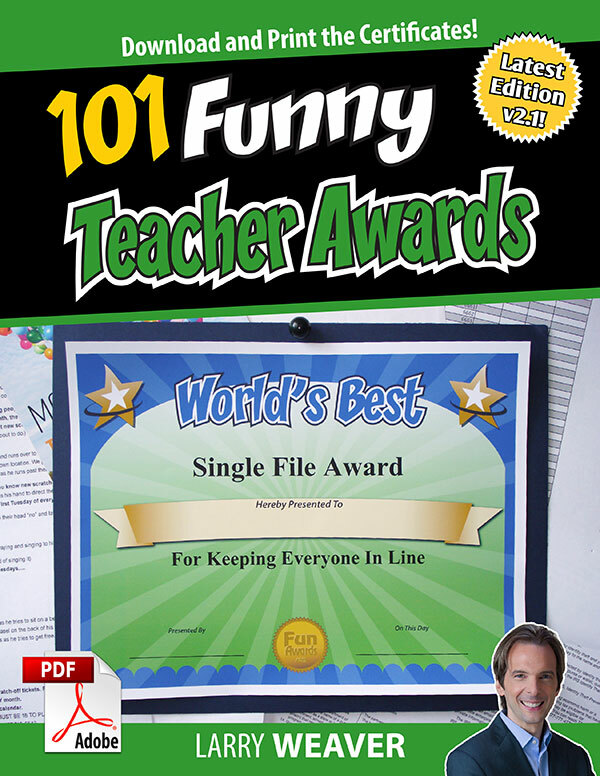 101 Funny Certificates for Family, Friends and Teammates. This collection has a little bit of everything. The emphasis on friends, family and teammates, makes them perfect for school superlatives, family reunions, and sports team banquets. Featured Awards: Txtng Award™, Let Me Tell You Award™, Back in the Day Award™, Peacocking Award™, Cheap Watch Award™, Fourth and Long Award™, Champagne Award™, Grandma's Dumplings Award™, A.D.D Award™, Brown Envelope Award™.